Usain Bolt shows his rivals a clean pair of heels to run the fastest 100m of the year in Korea on Wednesday. (CNN) -- Sprint-king Usain Bolt showed he could again prove dominant in the sprint distances by running the fastest 100-meters of the year in Daegu, Korea on Wednesday. The Jamaican, who is world and Olympic champion -- as well as world record holder -- in both the 100m and 200m recovered from a slow start to power to an explosive time of 9.86 seconds. Compatriot Michael Frater was almost three-tenths of a second slower in 10.15 seconds, while American Mike Rodgers finished in third place. New American hope Travis Padgett, who many believe can run Bolt close this season, trailed home in a disappointing fifth position. 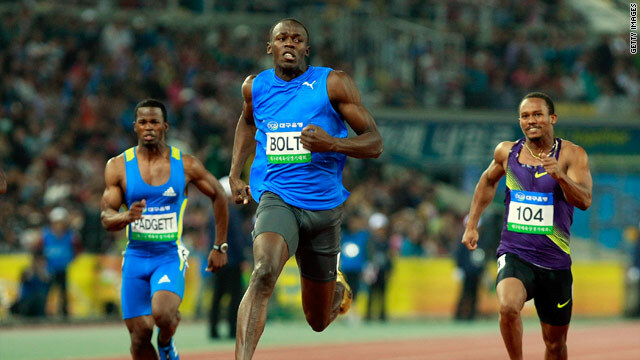 Bolt will next race in the 200m in Sunday's Diamond League meeting in Shanghai, China.